The factory Smith&Wesson SW22® Victory™ trigger stands out in the rimfire market for its crisp feel and light trigger pull. But even good triggers can be made GREAT! The new TANDEMKROSS Victory Trigger for the Smith & Wesson SW22® Victory™ is the ultimate SW22® trigger upgrade – ideal for speed shooting competitors! 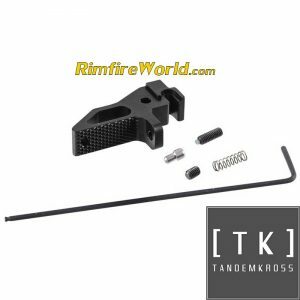 The TANDEMKROSS Victory Trigger removes nearly all pre-travel upon installation, and comes with pre- and post-travel adjustment screws to allow each shooter customize their SW22® trigger upgrade. The skeletonized, lightweight design of the TANDEMKROSS “Victory” trigger provides a flat face that allows the shooter to pull straight back and makes it easier to tell if they are pulling too far to the left or right. In addition to actually reducing the trigger pull weight by up to .5lbs, the flat-faced design also allows the operator to place their finger lower on the trigger, increasing leverage and giving the perception of an even lower pull weight. The textured SW22® trigger provides a no-slip surface regardless of speed or weather and allows for short, repeatable, identical trigger pulls. The trigger is made from aircraft-grade aluminum to be lightweight and durable. The TANDEMKROSS “Victory” Trigger for SW22® Victory™ is one of the best SW22® upgrades for competition shooters. Get yours today and take a giant step closer to VICTORY! If there’s one problem with Volquartsen .22 pistols it’s that it is very difficult to decide which one to buy. The newest addition to the Volquartsen lineup the “Scorpion” doesn’t make it any easier. The Volquartsen Scorpion 22 Pistol is the ultimate lightweight target pistol. The Volquartsen LLV Upper has been combined with the lightweight VC Target Frame to create a very lightweight and extremely accurate 22 LR. Also included the Volquartsen Competition Bolt as a standard item. The standard configuration on the Volquartsen Scorpion comes with 1/2X28 muzzle threads with thread protector. It is also available without muzzle threads or with compensator installed on muzzle threads. Volquartsen Scorpion Pistol weighs under 2lbs! The Scorpion Pistol is available with a silver or black frame in two configurations. Several grip options are also available: Volthane Target Grips (Target 22 style only), Laminated Wood Target Grips (Target 22 style only), Aluminum Grips or the Hogue Monogrip. Open model comes standard with a 4.5” barrel and compensator. The SMITH WESSON SW22 VICTORY TARGET PISTOL (pictured above) sports a 5.5-inch stainless steel, match grade bull barrel with a recessed muzzle crown. It includes fiber optic front and rear sights, two 10-round magazines, and the rail segment that can replace the rear sight base to mount optics .22 LR, 5.5″ Barrel, 10+1 Rounds. 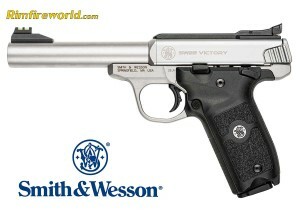 Note: Smith & Wesson offers the Victory Target Pistol in a factory threaded barrel option. All other features are identical with the exception of 1/2×28 tpi threading and a thread protector. The barrel is still 5.5 inches long, so the front sight is moved slightly back to allow space for threading.